In the early days of Words to Eat By, I blogged about Kasha Varnishkes as my Madeleines, the food that brings long-forgotten memories rushing back. But see, that’s silly. Everyone knows that Proust was talking about a cookie. And if Proust were Jewish*, growing up in or around New York City in the 70s, his Madeleine would be a Black & White Cookie. Cakey, ever so slightly lemony, with that gooey-but-not-sloppy bicolor icing, and as big as saucer, it is the cookie of my childhood. Back then, we’d go to Lydig Avenue in the Bronx regularly—at the time it was a Jewish neighborhood, with kosher butchers and bakers and much lower prices than my parents could find in Westchester, where we lived. A Black & White was almost always part of the trip. I was a major chocoholic already, and I was convinced that vanilla wasn’t actually a flavor—it was more an absence of flavor—so I’d scorn the white part and chow down on the black. Embarrassing as it is to admit now, I vividly remember sitting in the way-back of the station wagon crying when white dominated my cookie, as happened from time to time. And I’m pretty sure I wasn’t, you know, a toddler then. These days I favor the white; it’s more purely sweet and that makes me happy now. 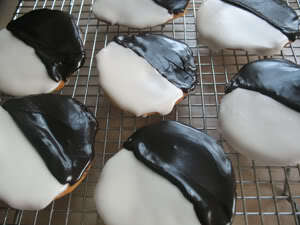 Don’t get me wrong—I still dig the black—but I always eat the white half first. And I’m proud to announce that Harry has inherited my devotion to the Black & White. While I find it impossible to walk down Second Avenue without stopping in at Moishe’s bakery (in my expert opinion, theirs are the best to be found in New York), Harry finds it impossible to walk past any bodega, deli, or bakery without announcing he must have a Black & White. That’s my boy. His preferred method of eating is to scrape off all the icing, whichever color his little fingers hit first, and maybe take a bite of the cookie part. The idea of just putting the thing in his mouth and chowing down is apparently too advanced for him. So the other day, when he told me yet again that he needed a Black & White, I ducked and feinted, and suggested we bake our own instead. He agreed, happily. This recipe is from a wonderful cookbook that came out quite a few years ago, when I was still working in publishing: Butter Sugar Flour Eggs: Whimsical Irresistible Desserts by Gale Gand, Rick Tramonto, and Julia Moskin. It’s the closest thing I’ve found to an authentic result—though they still come out a little too brittle, not quite cakey enough, for my taste. So how do you eat your Black & Whites? Do you have a recipe you trust? I’d love to try it! Anne at Chef on Call already told me about Martha Stewart’s version, which are on the agenda. Other candidates are more than welcome. *Yes, I know. Some would say that Proust was Jewish. Cream the butter in a mixer fitted with a paddle attachment (or using a hand mixer) until smooth. Add the sugar and beat until fluffy. Add the eggs, milk, and extracts and mix to combine. Combine the flours, baking powder, and salt and mix well. Add the dry ingredients to the sugar-egg mixture and mix to blend. Bake for about 20 minutes [12-14 with the smaller scoop], until golden. Let cool on wire racks. Stir the confectioners’ sugar, milk, and vanilla together until smooth. 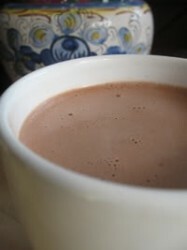 Transfer half of the icing to another bowl and stir in the cocoa until smooth. Turn the cooled cookies over, so that the flat bottoms face up. Spread white icing on half of each flat surface, then spread the other halves with chocolate icing. Let set at room temperature for 30 minutes. Oooh, delicious. I LOVE these cookies and am always looking for a recipe to use at home. Now I have one I know will be delicious! Finally! Was waiting for these photos, you know, to torture myself. Adding these cookies to my "things to make when I'm not pregnant and can stuff myself full of sugar again" list. Your gooey frosting looks better than the dried out version I see in the bakeries around here. I've actually NEVER had one of these. Kelsey, this recipe is indeed a good one! Not 100% accurate texture-wise, as I said in the post, but the flavors are there. Amber, you've never had one?!?! I think it's more of an east coast thing, possibly even an NYC thing. Have that baby already so you can eat some! These are gorgeous! I wonder if the recipe could easily be made gluten free? I think it's an East Coast thing, because I remember seeing these in delis in DC but don't think I've ever had one (or at least, a good one). I've always loved the white half more than the chocolate, too!! I've never tried making them, but I think I'll have to now! Stephanie, I have zero experience with gluten-free recipes. Wish I could help! 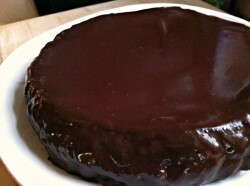 I assume you're familiar with http://glutenfreegirl.blogspot.com/? Wordy & Alejandra, if you do make them, please report back! I always like to hear about other people's experiences with these recipes. 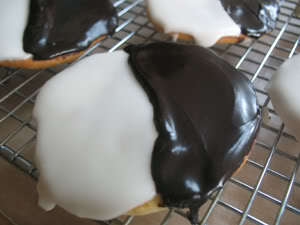 I have a similar abiding passion for black and white cookies. As Seinfeld said, "look to the cookie." The recipe I've been using is from Nancy Bagget's All-American Cookie book, which is a great resource. Her recipe has some sour cream in the cookie part, which is a nice balance to the icing and works well with the lemon. Thanks for the book rec, Carrie–I'd never heard of that one, but I just ordered it from Amazon. Can't resist cookie cookbooks. I have a rather embarrassing confession to make. I just made these cookies. After I put them in the oven, so proud of myself, I realized I had forgotten to put the milk in the cookies!! I let them bake and iced them anyway. They turned out really tasty (though a little crunchy!) and I can only imagine how good they will be when I make them correctly!! Oh no, Chanda! 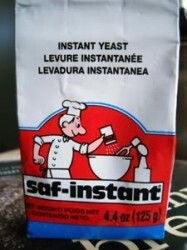 They must be quite different–but I sometimes find a serendipitously good recipe tweak thanks to forgetfulness.